Meal preparation and eating healthy and nutritional food is such an important part of staying well, especially for seniors. Good food, on a regular and consistent schedule, is necessary for emotional and physical health. For older individuals living alone, keeping track of what and when to eat can be a complicated task. Never mind having to prepare, cook, and clean up afterward. Caregivers at Home Care Powered by AUAF are ready to assist with all things related to eating well and caring for seniors. Planning a single meal can be an involved task. Planning meals for the week can seem impossible. Doing so, however, is key to staying on a regular and balanced diet that will provide strength needed to live independently. Our caregivers can take food inventory and make shopping lists or menus. They will work with you or your loved one to create a shopping list that is both healthy and familiar. They can help keep track with recommendations from your nutritionist or doctor, and tailor meal to any medical conditions such as diabetes or high blood pressure. It’s not just about keeping track of what you have and need, but also, how you will get it? Our caregivers can accompany you or your loved one to the store and help with shopping and bringing in the groceries. If you can’t make it to the store, they’ll go for you and handle your shopping needs. Having someone there to help gives you piece of mind knowing that the refrigerator will be stocked with fresh food for healthy meals, always. For seniors who have health or mobility issues, preparing a meal can be very difficult. Our caregivers can prepare the meals for them or simply provide supervision and assistance as needed. They can prepare favorite dishes, or ones that are familiar. They can assist as little, or as much as is needed. As people age, they find that where they once sat around a table full of familiar faces during dinner time, they are now alone. Caregivers from Home Care Powered by AUAF can provide companionship during meal time. You or your loved one will have someone to talk to and share with. No one likes to clean up after a meal, especially not if they have health and mobility issues. 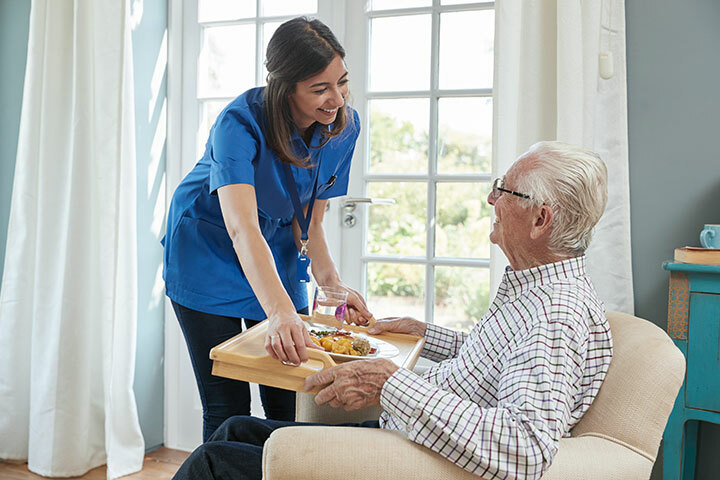 Our caregivers can clean up afterward and make sure you or your loved one feels full and satisfied without having to worry about the mess. Our core mission is to ensure our clients’ healthy lifestyle and well-being. Call us today at 877-947-2685 and ask how Home Care Powered by AUAF can help with your meal prep needs.